Mediaplanet’s Restaurants campaign found within USA TODAY and online, acts as an educational guide for food service professionals. Statistics show that most restaurants don’t make a profit until after their first 3-5 years of business, making the initial years essential to their sustainability. As we approach the conclusion of 2018 and the Worldwide Food Service Safety Month, Mediaplanet launches their newest “Restaurants in America” campaign. This campaign sheds light on the vast growing industry within its health and safety aspect as well as the industry standards for equipment, supplies, technological advancements and trends. Restaurant and food service jobs have been increasing since 2017, growing faster than health care, construction, and manufacturing. In some metros, restaurants are powering the entire economy. More than a third of Cleveland’s new jobs since 2015 are in restaurants, according to EMSI data. The food distributor industry employs a workforce of 350,000 people and supports an additional 700,000 jobs in the nation’s economy, for a total employment impact of more than 1 million jobs, according to the IFDA. With an industry growing and evolving so rapidly, new advancements and regulations abound to get lost in the shuffle. Statistics show that most restaurants don’t make a profit until after their first 3-5 years of business, making the initial years essential to their sustainability. Few restaurateurs can afford to fully stock their kitchen out of pocket, leaving them using outdated and unsafe equipment. With the new industrial kitchen equipment being used as the industry standards, restaurateurs and food service professionals need to know not only what equipment to use, but where to obtain them. 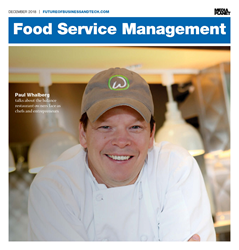 Executive chef, TV personality and restaurateur Paul Wahlberg are featured on the cover of the print publication. Prior to his starring role on the hit A&E show “Wahlburgers”, owning the burger restaurant chain of the same name, and paving the way for his family matriarch inspired Alma Nove restaurant, Paul Wahlberg simply set off to become a chef with a love of food. Through an exclusive interview on the interior, Paul shares his beginnings as a young chef in Boston, and how he grew to be a multi-restaurant owner and executive chef. The article provides insight on how Paul was able to make his restaurants an extension of his artistic culinary vision. You must “allow the team to build its identity in the restaurant’s framework,” he noted. This campaign was made possible with the support of the U.S. Small Business Administration, National Sanitation Foundation, Modern Restaurant Management, Purell, QSR Automations, JMH Premium Institute of Food Technologists and the International Food and Beverage Technology Association (IFBTA).